"In a way I had never quite comprehended before, I realized the role I could play in court and the possibilities before me as a defendant. I was the symbol of justice in the court of the oppressor, the representative of the great ideals of freedom, fairness and democracy in a society that dishonoured those virtues. I realized then and there that I could carry on the fight even in the fortress of the enemy." ୧୯୯୧ରେ ଜାତୀୟ କଂଗ୍ରେସର ମୁଖ୍ୟ କାର୍ଯ୍ୟାଳୟ ହୋଇଥିବା ଜୋହାନ୍ସବର୍ଗ ସ୍ଥିତ "ସେଲ ହାଉସ"
↑ ୧.୦ ୧.୧ Mandela 1994, p. 3; Sampson 2011, p. 3; Smith 2010, p. 17. ↑ Guiloineau 2002, p. 23; Mafela 2008. ↑ Guiloineau 2002, p. 26; Mafela 2008. ↑ Mandela 1994, p. 17. ↑ Mandela 1994, pp. 45–47; Sampson 2011, p. 15; Smith 2010, p. 31. ↑ Mandela 1994, p. 52; Sampson 2011, pp. 17–18; Smith 2010, pp. 31–32. ↑ Mandela 1994, pp. 53–54; Sampson 2011, pp. 18–21; Smith 2010, p. 32. ↑ Mandela 1994, p. 56; Smith 2010, p. 32. ↑ Mandela 1994, pp. 62–65; Sampson 2011, pp. 21, 25; Smith 2010, pp. 33–34. ↑ Mandela 1994, pp. 62–63; Sampson 2011, pp. 24–25; Smith 2010, pp. 33–34. ↑ Mandela 1994, p. 68; Sampson 2011, p. 25; Smith 2010, p. 35. ↑ Mandela 1994, pp. 70–71; Sampson 2011, p. 26. ↑ Mandela 1994, pp. 78–86; Sampson 2011, pp. 26–27; Smith 2010, pp. 34–35. ↑ Mandela 1994, pp. 73–76; Sampson 2011, pp. 27–28; Smith 2010, pp. 36–39. ↑ Mandela 1994, pp. 89–94; Sampson 2011, pp. 29–30; Smith 2010, p. 40. ↑ Mandela 1994, pp. 96–101; Sampson 2011, pp. 30–31; Smith 2010, p. 41. ↑ Mandela 1994, pp. 104–105; Sampson 2011, pp. 32–33; Smith 2010, pp. 43, 48. ↑ Mandela 1994, pp. 122–123; Sampson 2011, p. 37; Smith 2010, p. 48. ↑ Mandela 1994, p. 100; Sampson 2011, p. 34; Smith 2010, p. 44. ↑ Mandela 1994, pp. 99, 108–110; Sampson 2011, p. 33; Smith 2010, pp. 44–45. ↑ Mandela 1994, pp. 113–116; Sampson 2011, p. 33; Smith 2010, pp. 45–46. ↑ Mandela 1994, pp. 118–119; Sampson 2011, p. 34. ↑ Mandela 1994, pp. 116–117, 119–120; Sampson 2011, p. 33; Smith 2010, p. 47. ↑ Mandela 1994, pp. 122, 126–27; Sampson 2011, p. 34; Smith 2010, p. 49. ↑ Mandela 1994, pp. 127–131; Sampson 2011, pp. 34–35; Smith 2010, pp. 64–65. ↑ Mandela 1994, p. 136; Smith 2010, p. 53. ↑ Mandela 1994, pp. 137–139; Sampson 2011, pp. 38–39; Smith 2010, p. 53. ↑ Mandela 1994, pp. 142–143; Smith 2010, p. 54. ↑ Mandela 1994, pp. 139–143; Sampson 2011, pp. 39–41; Smith 2010, pp. 52–56. ↑ ୫୧.୦ ୫୧.୧ Mandela 1994, pp. 144, 148–149; Sampson 2011, p. 36; Smith 2010, pp. 59–62. ↑ Mandela 1994, pp. 149, 152; Sampson 2011, p. 36; Smith 2010, pp. 60–64. ↑ Mandela 1994, pp. 150, 210; Sampson 2011, p. 36; Smith 2010, p. 67. ↑ Mandela 1994, p. 151; Smith 2010, p. 64. ↑ Mandela 1994, pp. 153–154; Sampson 2011, p. 48; Smith 2010, p. 66. ↑ Mandela 1994, pp. 154–157; Sampson 2011, p. 49; Smith 2010, p. 66. ↑ Mandela 1994, pp. 159–162; Sampson 2011, pp. 51–52; Smith 2010, pp. 70–72. ↑ Mandela 1994, pp. 162–165; Sampson 2011, pp. 53–55; Smith 2010, pp. 72–73. ↑ Sampson 2011, p. 35; Smith 2010, pp. 68–70. ↑ Mandela 1994, p. 168; Sampson 2011, pp. 55–56. ↑ Mandela 1994, pp. 165–167; Sampson 2011, pp. 61–62; Smith 2010, pp. 74–75. ↑ Mandela 1994, p. 176; Sampson 2011, pp. 63–64; Smith 2010, p. 78. ↑ Mandela 1994, pp. 177–172; Sampson 2011, pp. 64–65; Smith 2010, pp. 75–76. ↑ Mandela 1994, p. 165; Smith 2010, p. 77. ↑ Mandela 1994, p. 170; Smith 2010, p. 94. ↑ Mandela 1994, pp. 182–183; Sampson 2011, pp. 66–67; Smith 2010, pp. 77, 80. ↑ Mandela 1994, pp. 183–188; Sampson 2011, p. 69; Smith 2010, pp. 81–83. ↑ Mandela 1994, pp. 194–195; Sampson 2011, pp. 72–73; Smith 2010, p. 85. ↑ Mandela 1994, pp. 195–198; Sampson 2011, pp. 71–72; Smith 2010, pp. 83–84. ↑ Mandela 1994, pp. 199–200, 204; Sampson 2011, p. 73; Smith 2010, p. 86. ↑ Mandela 1994, pp. 205–207, 231; Sampson 2011, pp. 81–82, 84–85; Smith 2010, pp. 116–117. ↑ Mandela 1994, pp. 209–210; Sampson 2011, p. 7; Smith 2010, p. 87. ↑ Mandela 1994, pp. 210–216; Sampson 2011, pp. 77–80; Smith 2010, pp. 87–93. ↑ Mandela 1994, pp. 293–294; Sampson 2011, pp. 76–77; Smith 2010, pp. 95–99, 105–106. ↑ Sampson 2011, p. 92. ↑ Mandela 1994, pp. 218–233, 234–236; Sampson 2011, pp. 82–84; Smith 2010, pp. 120–123. ↑ Mandela 1994, pp. 226–227; Sampson 2011, p. 84; Smith 2010, p. 118. ↑ Mandela 1994, pp. 243–249; Sampson 2011, pp. 87–95; Smith 2010, pp. 118–120, 125–128. ↑ Mandela 1994, pp. 253–274; Sampson 2011, pp. 96–99; Smith 2010, pp. 130–132. ↑ Mandela 1994, p. 275; Sampson 2011, pp. 101–102. ↑ ୮୩.୦ ୮୩.୧ Mandela 1994, p. 296; Sampson 2011, p. 110; Smith 2010, pp. 99–104. ↑ Mandela 1994, pp. 306–311; Sampson 2011, pp. 110–113; Smith 2010, pp. 104, 132–145. ↑ Mandela 1994, pp. 283–292; Sampson 2011, pp. 103–106; Smith 2010, pp. 163–164. ↑ Mandela 1994, pp. 299–305; Sampson 2011, pp. 116–117; Smith 2010, pp. 167–168. ↑ Mandela 1994, pp. 331–334; Sampson 2011, pp. 122–123; Smith 2010, p. 167. ↑ Mandela 1994, pp. 327–330; Sampson 2011, pp. 117–122; Smith 2010, pp. 171–173. ↑ Mandela 1994, pp. 342–346; Sampson 2011, pp. 130–131; Smith 2010, pp. 173–175. ↑ Mandela 1994, pp. 347–357; Sampson 2011, pp. 132–133; Smith 2010, p. 175. ↑ Mandela 1994, pp. 357–364; Sampson 2011, pp. 134–135; Smith 2010, p. 177. ↑ Mandela 1994, pp. 373–374; Sampson 2011, pp. 140–143; Smith 2010, pp. 183–185. ↑ Mandela 1994, pp. 377–380; Sampson 2011, p. 143; Smith 2010, p. 178. ↑ Mandela 1994, pp. 283–287; Sampson 2011, pp. 144–146, 154; Smith 2010, pp. 186–188, 193. ↑ Mandela 1994, pp. 289–291; Sampson 2011, pp. 147–149; Smith 2010, pp. 188–189. ↑ Mandela 1994, pp. 393–396; Sampson 2011, pp. 150–151; Smith 2010, pp. 206–210. ↑ Mandela 1994, pp. 397–398; Sampson 2011, pp. 151–154; Smith 2010, pp. 209–214. ↑ Mandela 1994, pp. 397–409; Sampson 2011, pp. 154–156; Smith 2010, pp. 191, 222–229. ↑ Mandela 1994, pp. 411–412. ↑ Mandela 1994, pp. 413–415; Sampson 2011, pp. 158–159; Smith 2010, pp. 239–246. ↑ Mandela 1994, pp. 418–425; Sampson 2011, pp. 160–162; Smith 2010, pp. 251–254. ↑ Mandela 1994, pp. 427–432; Sampson 2011, pp. 163–165; Smith 2010, pp. 255–256. ↑ Mandela 1994, pp. 432–440; Sampson 2011, pp. 165–167; Smith 2010, pp. 256–259. ↑ Mandela 1994, pp. 441–443; Sampson 2011, pp. 167–169; Smith 2010, pp. 259–261. ↑ Mandela 1994, pp. 443–445; Sampson 2011, pp. 169–170; Smith 2010, pp. 261–262. ↑ Mandela 1994, pp. 435–435; Sampson 2011, pp. 170–172; Smith 2010, pp. 275–276. ↑ Mandela 1994, pp. 463–465; Sampson 2011, pp. 173–174; Smith 2010, pp. 292–293. ↑ Mandela 1994, pp. 468–482; Sampson 2011, pp. 174–176. ↑ Mandela 1994, p. 458. ↑ Mandela 2004, pp. 27–32; Sampson 2011, pp. 183–186; Smith 2010, pp. 292–295. ↑ Mandela 2004, pp. 33–42; Sampson 2011, pp. 186–190. ↑ Mandela 2004, pp. 42–57; Sampson 2011, pp. 190–194; Smith 2010, pp. 300–302. ↑ Mandela 2004, p. 62; Sampson 2011, pp. 194–195; Smith 2010, p. 303. ↑ Mandela 2004, pp. 63–68; Sampson 2011, pp. 196–197; Smith 2010, p. 306. ↑ Mandela 2004, pp. 75–78; Sampson 2011, p. 204; Smith 2010, pp. 307–308. ↑ Mandela 2004, pp. 79–80; Sampson 2011, p. 205; Meredith 2010, p. 279. ↑ Mandela 2004, p. 126; Sampson 2011, pp. 205, 258; Meredith 2010, p. 299. ↑ Mandela 2004, pp. 102–108; Sampson 2011, p. 205; Meredith 2010, p. 283. ↑ Mandela 2004, pp. 83, 90, 136–138; Meredith 2010, pp. 284, 296–298. ↑ Sampson 2011, pp. 210–214; Meredith 2010, pp. 298–299. ↑ Sampson 2011, pp. 236–241, 288–294; Meredith 2010, pp. 292–295. ↑ Sampson 2011, p. 232; Meredith 2010, pp. 301, 313. ↑ Sampson 2011, p. 229; Meredith 2010, pp. 295, 299–301. ↑ Sampson 2011, p. 221; Meredith 2010, pp. 301–302. ↑ Sampson 2011, p. 222; Meredith 2010, p. 337. ↑ Sampson 2011, p. 241; Meredith 2010, p. 334. ↑ Sampson 2011, pp. 246–247; Meredith 2010, pp. 303–304. ↑ Sampson 2011, pp. 222, 235; Meredith 2010, p. 301. ↑ Sampson 2011, p. 231. ↑ Sampson 2011, pp. 223–225; Meredith 2010, pp. 308–310. ↑ Sampson 2011, pp. 226–227. ↑ Sampson 2011, pp. 242–243; Meredith 2010, p. 317. ↑ Sampson 2011, pp. 259–276; Meredith 2010, pp. 324–327. ↑ Sampson 2011, pp. 277–283; Meredith 2010, pp. 327–328. ↑ Sampson 2011, pp. 315–316. ↑ "List of the Recipients of the Jawaharlal Nehru Award". ICCR. Retrieved 29 June 2013. ↑ Reddy, ES (July 1988). "Free Nelson Mandela – an account of the Campaign to Free Nelson Mandela and all other Political Prisoners in South Africa". ANC. Retrieved 29 June 2013. In August 1981, the City of Glasgow awarded the Freedom of the City to Nelson Mandela. ↑ Sampson 2011, pp. 319–320; Meredith 2010, pp. 338–339. ↑ Sampson 2011, p. 321. ↑ Sampson 2011, pp. 324–325; Meredith 2010, p. 340. ↑ Sampson 2011, pp. 324–325; Meredith 2010, pp. 346–347. ↑ Sampson 2011, p. 326; Meredith 2010, p. 347. ↑ Sampson 2011, pp. 335–336; Meredith 2010, pp. 341–346. ↑ Sampson 2011, pp. 338–342; Meredith 2010, pp. 249–256. ↑ Meredith 2010, p. 340. ↑ Sampson 2011, pp. 330–332; Meredith 2010, pp. 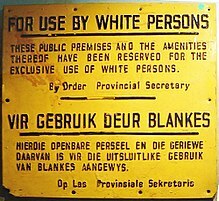 351–352; "Mandela's response to being offered freedom". ANC. Archived from the original on 22 June 2008. Retrieved 28 October 2008. ↑ Sampson 2011, pp. 343–345; Meredith 2010, p. 358. ↑ Sampson 2011, pp. 347–355; Meredith 2010, pp. 359–360. ↑ Sampson 2011, pp. 363–378; Meredith 2010, pp. 362–368. ↑ Sampson 2011, p. 368; Ketchum, Mike. "The Mandela Concert, Wembley 1988". African National Congress. Archived from the original on 9 July 2008. Retrieved 23 December 2008. ↑ Sampson 2011, pp. 373–380; Meredith 2010, pp. 371–383. ↑ Sampson 2011, pp. 369–370; Meredith 2010, p. 369. ↑ Sampson 2011, p. 381; Meredith 2010, pp. 369–370. ↑ Sampson 2011, pp. 384–385, 392–393; Christopher S. Wren (8 December 1988). 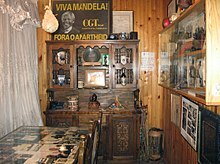 "Mandela Moved to House at Prison Farm". The New York Times. Archived from the original on 13 February 2013. Retrieved 13 February 2013. ↑ Sampson 2011, p. 386; Meredith 2010, p. 388. ↑ Sampson 2011, pp. 390–392; Meredith 2010, pp. 387–388. ↑ Sampson 2011, pp. 392–397. ↑ Sampson 2011, pp. 399–402; Meredith 2010, pp. 369–397; "1990: Freedom for Nelson Mandela". BBC. 11 February 1990. Archived from the original on 26 February 2013. Retrieved 28 October 2008. ↑ Burns, John F. (11 February 1990). "South Africa's new era; Mandela to go free today; De Klerk proclaims ending of 'chapter' after 27 years". The New York Times. Retrieved 30 June 2013. ordinary South Africans have not heard his voice in a generation. Until tonight, when the Government released a photograph of him meeting on Friday with Mr. de Klerk, they had not even seen what Mr. Mandela looked like since the last published photograph was taken in a prison garden in 1968. ↑ Kraft, Scott (11 February 1990). "S. Africa to Free Black Leader Mandela Today : Apartheid: Activist has been in prison for 27 years. De Klerk's action is the latest step to lure black anti-apartheid leaders to the negotiating table". Los Angeles Times. Retrieved 30 June 2013. The government also released the first photograph of Mandela in 27 years. It showed a smiling, trim Mandela, dressed in a gray suit, standing beside De Klerk in the presidential offices in Cape Town. ↑ "FW de Klerk & Nelson Mandela – first meeting 1990". 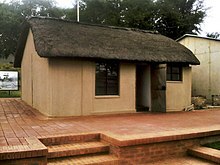 FW de Klerk Foundation. Retrieved 30 June 2013. ↑ Sampson 2011, p. 407; Meredith 2010, pp. 399–402; Ormond, Roger (12 February 1990). "Mandela free after 27 years". The Guardian. London. Archived from the original on 26 February 2013. Retrieved 28 October 2008. ↑ Sampson 2011, pp. 408–409; Meredith 2010, pp. 400–402; The text of Mandela's speech can be found at "Nelson Mandela's address to Rally in Cape Town on his Release from Prison". ANC. 11 February 1990. Archived from the original on 28 July 2008. Retrieved 28 October 2008. ↑ Sampson 2011, pp. 409–410; Meredith 2010, pp. 403–405. ↑ Sampson 2011, pp. 412–414; Meredith 2010, pp. 409–410; "ITN Source website: "...Mandela onto stage..."". Itnsource.com. 16 April 1990. Archived from the original on 14 February 2013. Retrieved 2012-12-27. ↑ Sampson 2011, pp. 415–418. ↑ Sampson 2011, p. 420; ; Meredith 2010, p. 410. ↑ Sampson 2011, pp. 418–420. ↑ Sampson 2011, pp. 424–427; Meredith 2010, pp. 412–413. ↑ Sampson 2011, pp. 428–429; Meredith 2010, p. 439. ↑ Sampson 2011, pp. 429–430; Meredith 2010, pp. 439–440. ↑ Sampson 2011, pp. 431, 448; Meredith 2010, p. 409. ↑ Sampson 2011, pp. 436–442; Meredith 2010, pp. 418–424. ↑ Sampson 2011, p. 444; Meredith 2010, pp. 425–426. ↑ Sampson 2011, pp. 456–459; Meredith 2010, pp. 443–446. ↑ Sampson 2011, pp. 461–462; Meredith 2010, pp. 462–463. ↑ Sampson 2011, pp. 463–467; Meredith 2010, pp. 467–471. ↑ Sampson 2011, p. 472; Meredith 2010, pp. 489–491. ↑ Sampson 2011, pp. 466, 470–471; Meredith 2010, pp. 449–450, 488. ↑ Sampson 2011, pp. 468–469; Meredith 2010, pp. 476–480. ↑ Sampson 2011, p. 474; Meredith 2010, p. 494. ↑ Sampson 2011, pp. 434–445, 473; Meredith 2010, p. 497. ↑ Cunningham, Matthew (3 June 2004). "Creme cameos". The Guardian. London. Archived from the original on 14 February 2013. Retrieved 26 October 2008. ↑ Sampson 2011, pp. 467–477; Meredith 2010, p. 495. ↑ Sampson 2011, p. 478; Meredith 2010, pp. 495–496. ↑ Sampson 2011, pp. 479–480. ↑ Sampson 2011, pp. 477–478; Meredith 2010, p. 484. ↑ Sampson 2011, p. 488; Meredith 2010, pp. 500–501. ↑ Sampson 2011, p. 490; Meredith 2010, pp. 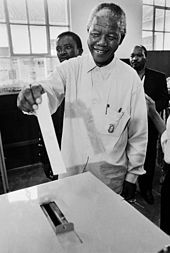 510–512; "This Day in History: April 27, 1994: South Africa holds first multiracial elections". History. Archived from the original on 26 February 2013. Retrieved 26 February 2013. ↑ Sampson 2011, p. 491; Meredith 2010, p. 512; Glen Levy (15 November 2010). "Top 10 Political Prisoners". Time. Archived from the original on 25 March 2013. Retrieved 25 March 2013. ↑ Sampson 2011, pp. 492–493; Meredith 2010, p. 514. ↑ Sampson 2011, p. 492; "Mandela becomes SA's first black president". BBC. 10 May 1994. Archived from the original on 25 February 2013. Retrieved 26 May 2008. ↑ Sampson 2011, pp. 508–511; Meredith 2010, p. 566. ↑ Sampson 2011, pp. 496–497; Meredith 2010, pp. 523, 543. ↑ Sampson 2011, p. 517; Meredith 2010, p. 543. ↑ Sampson 2011, pp. 525–527; Meredith 2010, pp. 547–548. ↑ Sampson 2011, p. 503; Meredith 2010, p. 495; Khumalo, Fred (5 August 2004). "How Mandela changed SA fashion". BBC. Archived from the original on 25 February 2013. Retrieved 28 October 2008. ↑ Sampson 2011, pp. 500, 507; Meredith 2010, pp. 539–542. ↑ Sampson 2011, pp. 546–549; Meredith 2010, pp. 574–575. ↑ Sampson 2011, pp. 495–496; Meredith 2010, p. 517. ↑ Sampson 2011, pp. 511, 534; Meredith 2010, p. 528. ↑ Sampson 2011, pp. 520, 522–523; Meredith 2010, pp. 523–524. ↑ Sampson 2011, pp. 491, 496, 524; Meredith 2010, pp. 517, 536. ↑ Sampson 2011, pp. 528–532; Meredith 2010, pp. 527, 551–564. ↑ Sampson 2011, p. 532; Meredith 2010, p. 563. ↑ Sampson 2011, pp. 514–515; Meredith 2010, p. 519. ↑ ୨୩୧.୦ ୨୩୧.୧ Houston & Muthien 2000, p. 62. ↑ Herbst 2003, p. 312. ↑ "Land Redistribution: A Case for Land Reform in South Africa". NGO Pulse. 10 February 2010. Archived from the original on 26 February 2013. Retrieved 21 November 2011. ↑ "Land Reform Policies in South Africa Compare To Human Rights Internationally" (PDF). Retrieved 11 February 2012. ; "No. 3 of 1996: Land Reform (Labour Tenants) Act, 1996". South African Government Online. 22 March 1996. Archived from the original on 26 February 2013. Retrieved 26 February 2013. ↑ "Faculty of Commerce at the University of Cape Town" (PDF). Commerce.uct.ac.za. 25 April 2007. Retrieved 27 December 2012. ↑ ୨୩୭.୦ ୨୩୭.୧ ୨୩୭.୨ "Why workers should vote ANC". Cosatu.org.za. Archived from the original on 26 February 2013. Retrieved 27 October 2012. ↑ Meredith 2010, pp. 571–573; Sampson, Anthony (6 July 2003). 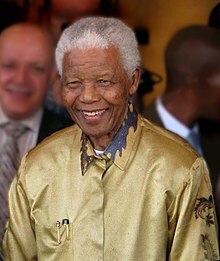 "Mandela at 85". The Observer. London. Archived from the original on 26 February 2013. Retrieved 26 May 2008. Text "Anthony Sampson " ignored (help); "Can Mandela's AIDS Message Pierce the Walls of Shame?". Peninsula Peace and Justice Center. 9 January 2005. Archived from the original on 26 February 2013. Retrieved 26 May 2008. ; Quist-Arcton, Ofeibea (19 July 2003). "South Africa: Mandela Deluged With Tributes as He Turns 85". AllAfrica. Archived from the original on 26 February 2013. Retrieved 26 May 2008. ↑ Sampson 2011, pp. 510, 565–68; Meredith 2010, p. 573. ↑ Sampson 2011, p. 510; Meredith 2010, pp. 544–547. ↑ Sampson 2011, pp. 561–567. ↑ Sampson 2011, pp. 556–557. ↑ Sampson 2011, p. 558. ↑ Sampson 2011, pp. 558–559; Thai, Bethuel (4 October 1998). "Lesotho to hold re-elections within 15 to 18 months". Lesotho News Online. Archived from the original on 26 February 2013. Retrieved 26 May 2008. ↑ Sampson 2011, p. 560. ↑ Sampson 2011, pp. 562–563. ↑ Sampson 2011, pp. 563–564; "Analysis: Lockerbie's long road". BBC. 31 January 2001. Archived from the original on 25 February 2013. Retrieved 26 May 2008. ↑ Sampson 2011, p. 534; Meredith 2010, pp. 529–530. ↑ Sampson 2011, p. 536. ↑ Sampson 2011, pp. 537–543; Meredith 2010, p. 568. ↑ Sampson 2011, pp. 549–551; Meredith 2010, p. 576. ↑ Battersby 2011, pp. 587–588; Meredith 2010, p. 576. ↑ Battersby 2011, pp. 588–589; Meredith 2010, p. 576. ↑ Battersby 2011, pp. 590–591; Meredith 2010, pp. 584–586. ↑ "Nelson Mandela Invitational Tees Off". GaryPlayer.com. 14 November 2003. Archived from the original on 25 February 2013. Retrieved 27 October 2008. ↑ Battersby 2011, p. 598; "Mandela 'responding well to treatment'". BBC. 15 August 2001. Archived from the original on 25 February 2013. Retrieved 26 May 2008. ↑ Pablo Tebas (13 July 2000). "Closing Ceremony". The Body. Archived from the original on 25 February 2013. Retrieved 25 February 2013. ↑ "XV International AIDS Conference – Daily Coverage". Kaisernetwork. 15 July 2004. Archived from the original on 25 February 2013. Retrieved 27 October 2008. ↑ Keith Weir (13 April 2003). "Equipo Nizkor – Mandela slams Western action in Kosovo, Iraq". Derechos.org. Reuters. Archived from the original on 21 February 2013. Retrieved 3 October 2010. ↑ Battersby 2011, pp. 591–592; Pienaar, John (1 September 2002). "Mandela warns Bush over Iraq". BBC. Archived from the original on 21 February 2013. Retrieved 27 October 2008. ; Cornwell, Rupert (31 January 2003). "Mandela lambastes 'arrogant' Bush over Iraq". The Independent. London. Archived from the original on 11 April 2013. Retrieved 27 October 2008. ; Fenton, Tom (30 January 2003). "Mandela Slams Bush on Iraq". CBS. Archived from the original on 25 February 2013. Retrieved 26 May 2008. ↑ Battersby 2011, p. 593. ↑ Battersby 2011, p. 598; ; Meredith 2010, p. 593; "I'll call you". SouthAfrica.info. 2 June 2004. Archived from the original on 25 February 2013. Retrieved 26 May 2008. ↑ ୨୭୩.୦ ୨୭୩.୧ Keyes, Allison (May 17, 2005). "Mandela, Bush Discuss Education, AIDS in Africa". NPR. Archived from the original on June 25, 2013. ↑ ୨୭୪.୦ ୨୭୪.୧ Hennessey, Kathleen (June 25, 2013). "The Obama-Mandela dynamic, reflected in a photo". Los Angeles Times. Archived from the original on June 25, 2013. ↑ Battersby 2011, p. 600; "Mandela joins 'Elders' on turning 89". MSNBC. Associated Press. 20 July 2007. Archived from the original on 25 February 2013. Retrieved 26 May 2008. ; "Mandela launches The Elders". SAinfo. 19 July 2007. Archived from the original on 25 February 2013. Retrieved 27 October 2008. ↑ ୨୭୭.୦ ୨୭୭.୧ "Nelson Mandela Celebrates 90th Birthday by Urging Rich to Help Poor". Fox News Channel. 18 July 2008. Archived from the original on 25 February 2013. Retrieved 27 October 2008. ↑ Bingham, John (6 May 2008). "Hyde Park concert to mark Mandela's 90th". The Independent. London: Independent Print Limited. Archived from the original on 25 February 2013. Retrieved 27 October 2008. ↑ Battersby 2011, p. 600; Batty, David (11 July 2010). "Nelson Mandela attends World Cup closing ceremony". The Guardian. London. Archived from the original on 25 February 2013. ↑ David Smith in Johannesburg. "South African courts step in over Mandela family burial row". The Guardian. Retrieved 2013-07-05. ↑ Moreton, Cole. "Nelson Mandela's grandson Mandla accused of grave tampering". Telegraph. Retrieved 2013-07-05. ↑ July 4 2013 at 09:40am By Henriette Geldenhuys. "Affidavit points out Mandla's 'master plan'". IOL.co.za. Retrieved 2013-07-05. ↑ Jon Gambrell (11 December 2012). "Mandela Has Lung Infection, South African Officials Say". The Huffington Post. Associated Press. Archived from the original on 25 February 2013. Retrieved 11 December 2012. ; "Mandela Has Surgery for Gallstones". The New York Times. Archived from the original on 25 February 2013. Retrieved 15 December 2012. ↑ "Nelson Mandela, 94, responding positively to treatment in hospital | CTV News". Ctvnews.ca. 2013-03-28. Retrieved 2013-06-10. ↑ "Nelson Mandela arrives home in ambulance". The Telegraph. Retrieved 6 April 2013. ↑ "Nelson Mandela hospitalized in serious condition". CNN. 8 June 2013. Retrieved 8 June 2013. ↑ "Nelson Mandela still in 'serious, but stable condition'". BBC News. Retrieved 11 June 2013. ↑ Walsh, Declan (23 June 2013). "Mandela's Condition Now Said to Be 'Critical'". The New York Times. Retrieved 23 June 2013. ↑ "Mandela's ambulance broke down, stranding him for 40 minutes". CBS News. Retrieved 22 June 2013. ↑ "Mandela's former bodyguard: 'Set him free'". CBS News. 15 June 2013. Retrieved 23 June 2013. ↑ "Nelson Mandela's Condition Becomes Critical". Sky News. Retrieved 23 June 2013. ↑ Karimi, Faith; Norgaard, Kim (June 23, 2013). "Nelson Mandela in critical condition, South Africa's presidency says". CNN. Retrieved 23 June 2013. ↑ "Nelson Mandela in critical condition". Al Jazeera. June 23, 2013. Retrieved 23 June 2013. ↑ Associated Press. "South Africa: Anti-apartheid leader Nelson Mandela's condition has turned critical". The Washington Post. Archived from the original on 2013-06-24. Retrieved 2013-06-24. ↑ By AFP 10:07AM BST 26 Jun 2013 (2013-06-26). "Mandela wished a 'peaceful end' by Cape Town Archbishop". Telegraph.co.uk. Retrieved 2013-07-05. ↑ "Zuma Cancels Trip Amid Mandela Worry". ABC News. Retrieved 26 June 2013. ↑ "Report: Nelson Mandela on life support". UPI. Retrieved 27 June 2013. ↑ "Nelson Mandela 'in permanent vegetative state'". news.com.au. Retrieved 4 July 2013. ↑ "Nelson Mandela is in 'vegetative state' and life support 'should be switched off', say doctors". The Telegraph. Retrieved 4 July 2013. ↑ Laing, Aislinn (2013-05-07). "Nelson Mandela's doctors deny he was in 'permanent vegetative state'". Telegraph. Retrieved 2013-07-05. ↑ "Clarification on the health of former President Mandela". The Presidency. Retrieved 2013-07-05. ↑ Meredith 2010, pp. 482–483. ↑ Sampson 2011, pp. 37, 584; Meredith 2010, p. 541. ↑ Geoffrey York (2013-04-16). "South Africans express disgust as Mandela family members cash in on icon's name". The Globe and Mail. Retrieved 2013-06-28. ↑ Jon Jeter (17 June 1999). "In S. Africa, a President Replaces an Icon; Mbeki Takes Over From Mandela, Nation's 'Saintly Man'". The Washington Post. – via HighBeam Research (subscription required). Archived from the original on 16 February 2013. Retrieved 3 February 2013. ↑ Sampson 2011, p. 246; Smith 2010, p. 147; Meredith 2010, p. 481. ↑ Andrew Quinn (16 April 2007). "Mandela's grandson becomes tribal chief, political heir". Reuters – via HighBeam Research (subscription required). Retrieved 3 February 2013. ↑ ୩୨୯.୦ ୩୨୯.୧ "Winnie Mandela". ANC. Archived from the original on 22 July 2008. Retrieved 27 October 2008. 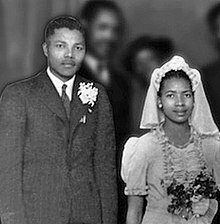 ↑ "Nelson and Winnie Mandela divorce; Winnie fails to win $5 million settlement". Jet. 8 April 1996. Archived from the original on 4 June 2012. Retrieved 27 October 2008. ↑ "Swaziland prince and princess attend Boston University". WGBH Boston. 13 May 1987. Retrieved 27 October 2008. ↑ "Daddy Stayed in Jail. That Was His Job'; Zenani Mandela's Life Without Father". The Washington Post. 8 November 1987. Archived from the original on 25 February 2013. Retrieved 27 October 2008. ↑ "Mandela daughter Zenani appointed Argentina ambassador". BBC News. 4 July 2012. Archived from the original on 3 February 2013. Retrieved 3 February 2013. ↑ "Mandela gets married on 80th birthday". CNN. 18 July 1998. Archived from the original on 14 June 2008. Retrieved 27 October 2008. ↑ ୩୩୬.୦ ୩୩୬.୧ "South Africa's Nelson Mandela dies in Johannesburg". BBC News. December 5, 2013. Retrieved 2013-12-05. ↑ Polgreen, Lydia (5 December 2013). "Mandela's Death Leaves South Africa Without Its Moral Center". The New York Times. Retrieved 2013-12-05. ↑ "Nelson Mandela discharged from South Africa hospital". BBC News. 6 April 2013. Archived from the original on 9 April 2013. Retrieved 9 April 2013. ↑ David Smith (30 March 2013). "South Africans pray for Nelson Mandela, but dismiss fears his death will mean chaos". The Guardian. Archived from the original on 9 April 2013. Retrieved 9 April 2013. ↑ "Nelson Mandela to spend Christmas in S Africa hospital". BBC News. 24 December 2012. Archived from the original on 3 February 2013. Retrieved 3 February 2013. ↑ Fairbanks, Eve (26 August 2009). "Father Disfigure". Newsweek. Archived from the original on 14 February 2013. Retrieved 14 February 2013. ↑ "Madiba conferred freedom of Johannesburg". Gauteng Provincial Government. 27 July 2004. Archived from the original on 21 June 2008. Retrieved 26 October 2008. ↑ "S. Africa renames Sandton Square as Nelson Mandela Square". Xinhua News Agency. 31 March 2004. Archived from the original on 3 January 2013. Retrieved 28 October 2008. ↑ Stern, Jennifer (27 August 2008). "Long walk immortalised in bronze". Media Club South Africa. Archived from the original on 14 February 2013. Retrieved 30 November 2009. ↑ "The Nobel Peace Prize 1993". Nobelprize.org. Archived from the original on 14 February 2013. Retrieved 26 October 2008. ↑ Battersby 2011, p. 601; "UN gives backing to 'Mandela Day'". BBC News. 11 November 2009. Archived from the original on 14 February 2013. Retrieved 11 November 2009. ↑ "President Honors Recipients of the Presidential Medal of Freedom". The White House. 9 July 2002. Archived from the original on 14 February 2013. Retrieved 26 October 2008. ↑ "Canada presents Nelson Mandela with the Queen Elizabeth II Diamond Jubilee medal". Government of Canada. 23 August 2012. Archived from the original on 14 February 2013. Retrieved 14 February 2013. ↑ "Mandela to be honoured with Canadian citizenship". CBC News. 19 November 2001. Archived from the original on 14 February 2013. Retrieved 26 October 2008. ↑ ୩୫୧.୦ ୩୫୧.୧ "How the awards have just kept flooding in". The Cape Times. – via HighBeam Research (subscription required). 18 July 2012. Archived from the original on 11 April 2013. Retrieved 14 February 2013. ↑ "List of all Bharat Ratna award winners". NDTV. 21 January 2011. Archived from the original on 14 February 2013. Retrieved 14 February 2013. ↑ "Mandela in Pakistan". The Independent. Independent Print Limited. 3 October 1992. Archived from the original on 14 February 2013. Retrieved 7 June 2010. ↑ "Statement on the Ataturk Award given to Nelson Mandela". African National Congress. 12 April 1992. Archived from the original on 1 October 2006. Retrieved 2 January 2007. ↑ "The Order of Merit". Royal Insight. November 2002. Archived from the original on 5 January 2005. Retrieved 26 October 2008. ↑ "Stevie Wonder Music Banned in South Africa". The New York Times. 27 March 1985. Archived from the original on 14 February 2013. Retrieved 26 May 2008. ↑ Liz McGregor (10 May 2004). "Brenda Fassie". The Guardian. Archived from the original on 3 February 2013. Retrieved 3 February 2013. ↑ Lee, Carmen (16 June 2003). "20 Years Ago Today". Time. Archived from the original on 14 February 2013. Retrieved 27 May 2008. ↑ Lamb, Bill. "Nickelback – If Everyone Cared". About. Archived from the original on 14 February 2013. Retrieved 23 December 2008. ↑ Trussell, Jeff. "Freedom Hero: Nelson Mandela". The My Hero Project. Archived from the original on 14 February 2013. Retrieved 23 December 2008. ↑ "AB de Villiers – The Fan Site". Abdevilliersfan.com. 2 August 2010. Archived from the original on 14 February 2013. Retrieved 3 October 2010. ↑ Keller, Bill. 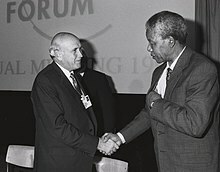 "Mandela and de Klerk (1997)". The New York Times. Archived from the original on 14 February 2013. Retrieved 26 October 2008. ↑ "The Color of Freedom (2007)". The New York Times. Archived from the original on 14 February 2013. Retrieved 14 February 2013. ↑ Dowell, Ben (11 March 2009). "BBC commissions Winnie Mandela drama". The Guardian. Archived from the original on 14 February 2013. Retrieved 11 March 2009. ↑ Battersby 2011, p. 601; Keller, Bill (15 August 2008). "Entering the Scrum". The New York Times. Archived from the original on 14 February 2013. Retrieved 14 February 2013. Guiloineau, Jean; Rowe, Joseph (2002). 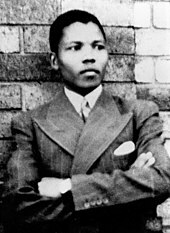 Nelson Mandela: The Early Life of Rolihlahla Mandiba. Berkeley: North Atlantic Books. pp. 9–26. ISBN 1-55643-417-0. Herbst, Jeffrey (2003). "The Nature of South African Democracy: Political Dominance and Economic Inequality". In Theodore K. Rabb, Ezra N. Suleiman. The Making and Unmaking of Democracy: Lessons from History and World Politics. London: Routledge. pp. 206–224. ISBN 978-0415933810. Houston, Gregory; Muthien, Yvonne (2000). "Democracy and Governance in Transition". In Yvonne Muthien, Meshack Khosa and Bernard Magubane. Democracy and Governance Review: Mandela's Legacy 1994–1999. Pretoria: Human Sciences Research Council Press. pp. 37–68. ISBN 978-0796919700. Kalumba, Kibujjo M. (1995). "The Political Philosophy of Nelson Mandela: A Primer". Journal of Social Philosophy. 26 (3): 161–171. Muthien, Yvonne; Khosa, Meshack; Magubane, Bernard (2000). "Democracy and Governance in Transition". In Yvonne Muthien, Meshack Khosa and Bernard Magubane. Democracy and Governance Review: Mandela's Legacy 1994–1999. Pretoria: Human Sciences Research Council Press. pp. 361–374. ISBN 978-0796919700.